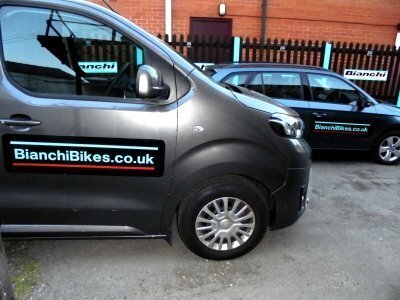 We are pleased to introduce our new personal Bianchi Bikes delivery service. This delivery service has been available since last year but now is extended nationwide from July 2018 to cover most areas of the UK mainland. There is a charge for this unique service based on mileage but starting at only £10.00 it is good value as bikes will be delivered to the customers address by a technician fully assembled and ready to ride. Please contact us for a quote on your order. At Bianchi Bike Store we’re proud to offer a fast, efficient and hassle-free service. Simply choose the items you want to buy, decide where you’d like them sent, and we’ll take care of the rest, making sure your items are carefully packaged and arrive quickly. All items delivered to a UK address will be dispatched using postoffice.co.uk Mail Tracked, Dispatch time is one to three working days, Tracking details are available on request. NB: Delivery times to BFPO addresses are dependent on British Forces Post Office schedules. Parcels over 2kg will be sent with UK Mail.com next day service. England, Northern Ireland, Scotland, Wales and all BFPO addresses. Note: Larger items that are too large to be handled by Royal Mail post to Northern Ireland, Highlands and all islands will be subject to quotation after time of ordering. Standard sized packets fall under the international customer rates, please see below. Please look at our postage rates. We will send all around the world. Parcels under 2kg will be sent using airmail on a “signed for” service. Items over 2kg will require a quote for destination.